(Sugar Land, Texas, Feb. 21, 2017) – The Sugar Land Skeeters announced today that the club has added three more players to the 2017 roster. 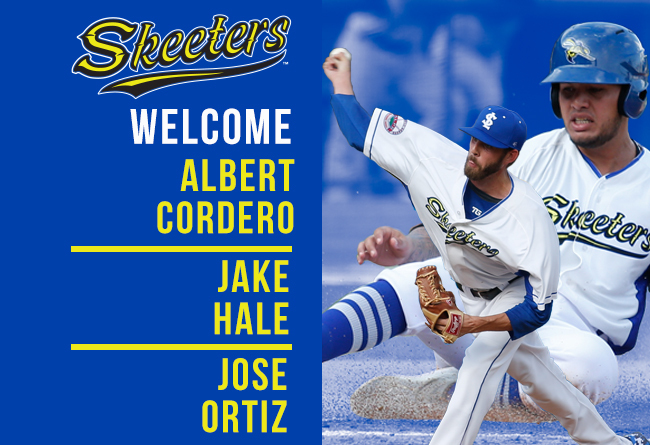 Catcher Albert Cordero and pitcher Jake Hale will return to the Skeeters while catcher Jose Ortiz is set to begin his first season with the club. Cordero, 27, returns to the Skeeters for the 2017 season. Undrafted out of Venezuela in 2008, he signed with the New York Mets where he would spend eight seasons and advance as high as Double-A with the Binghamton Mets in 2015. Last season, he batted .275 and had 50 hits in 56 games with the Skeeters, hitting .302 down the stretch during the last twelve games as the Skeeters made their magical 10-0 run on their way to the Atlantic League title. Hale, 31, was an integral part of the Skeeters starting rotation last season and returns to Sugar Land to help defend the club’s championship. The 6’7” right-hander graduated from Alexander High School in Ohio where he was selected 1st team All-Ohio as a senior and was a four-year letterman in basketball, joining the 1,000-point club. Hale played college baseball for four years at Ohio State and had 18 saves in his final year, which led the Big 10 and was named a 1st Team All Big 10 player. Jake was drafted 3 times, in 2005 by the Cleveland Indians (24th round), 2007 by the Toronto Blue Jays (20th round), and 2009 by the Arizona Diamondbacks (27th round) and made it to Advanced-A with the Visalia Rawhide (AZ) in 2010, posting a 0.24 ERA in 25 games. After becoming primarily a starter in 2013, he has gone 30-14 in the last three seasons. Last season, the two-time Atlantic League All-Star was 6-3 with a 3.73 ERA in 103.2 innings with the Skeeters and will return for his 9th season of professional baseball this year. Ortiz, 22, joins the Skeeters after playing in his native country of Puerto Rico last year. The right-handed power-hitting catcher was originally drafted in 2012 by the Cincinnati Reds in the 17th round and was a top 10 prospect in Baseball Prospectus. At only 18 years old and in his first year as a pro in Cincinnati, Ortiz hit .359 in the Arizona League and was the Reds’ #21 prospect in 2015. Opening Day for the Skeeters 2017 season is set for Thursday, April 20 at Constellation Field when they host the Bridgeport Bluefish in a 7:05 PM game. Season tickets, mini plans and flex books are on sale now at the TDECU Ticket Office or online at www.sugarlandskeeters.com. Visit the Skeeters website at SugarLandSkeeters.com and follow on Facebook, Instagram and Twitter for all the latest news on the team.